It’s understandable to be a little more cautious with your social networking profiles nowadays…or maybe you’re just too lazy to take a photo and put it up. 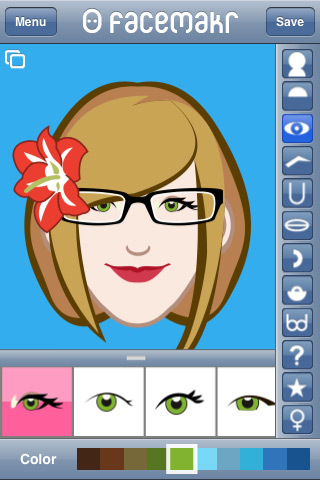 Whatever your reason for having an avatar instead of a photo, Dadako Studios has an app that can help with making one: Facemakr! Tap the Let’s Start bar to begin; if you have been using the app and want to start fresh, tap the gear in the top left corner to Reset the canvas. Once you begin, you are faced with a blank gray canvas, and plenty of icons on the right side. Each icon features certain characteristics, such as face shape, hairstyle, accessories, etc. ; tap each one to load the options and palettes on the bottom. Often, you will have to scroll through the options by flicking left and right until you reach the one that matches the closest. The only major complaint I have with Facemakr is with its awkward main menu page: it can be better utilized than just a huge picture of the Facemakr icon. For instance, it’d be very nice to include a way to view basic instructions in how to scale, position, etc., instead of blindly fumbling about to figure it out yourself…perhaps even a link to a gallery page of all your creations. As it is, the scaling options offered make for a huge variation in faces, and the graphics are clean and crisp and occasionally hilarious. Of course, it would only benefit from adding even more choices! For $2.99, I expected a bit more to choose from, but as long as the developers continue to update, Facemakr would be worth the download. AppSafari review of Facemakr was written by Julie Guan on May 11th, 2010 and categorized under App Store, Art, Fun, Social. Page viewed 3079 times, 2 so far today. Need help on using these apps? Please read the Help Page.